What makes a great book? Book-lovers, teachers and critics offer many aphorisms about classics but most agree: a book, to be truly great, has to at least be exceptionally enjoyable to read, even as it offers something wise or good or new — inspiration, information, a new way to see. Great content well delivered. I kept thinking this as I was reading the brand new book by N.T. 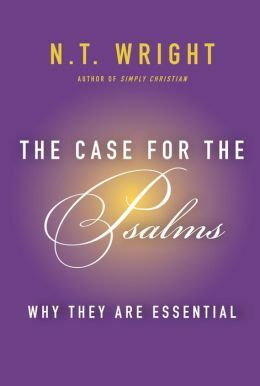 Wright, The Case for the Psalms: Why They Are Essential (HarperOne; $22.99 – our 20% off SALE PRICE = $18.40) because I concluded early on that it was a truly great book. It is the best book I’ve read on the Psalms and it is the best book of Biblical studies I’ve read all year. I was immediately taken by the strong balance of personal reflection and scholarly insight, Wright’s own candid concerns and his remarkably learned explanations. He noted that he is not an Old Testament scholar, but his insight was nonetheless world-class. And, again, it was written in a way that was such a joy to read. I even liked the rather small, compact-size and the squat hardback feel in the hand. So, yes, it is a great book. As soon as I was finished, I started reading it again (something I rarely do.) I am part-way through my second read and cannot contain my enthusiasm. I think it is a great book, and believe that it should be widely read. I hope you agree and buy one or more today. The Case for Psalms does teach new things (at least for me, and I suspect nearly any reader, even those who are fluent in Biblical studies.) Wright explains contexts and settings, a bit here and there about the development of the use of the Psalms, and certainly many New Testament connections — wow, does he connect the dots! His Biblical knowledge is prodigious, and his insight about how the canonical story of redemption fits together is impressive. But to say it “teaches” doesn’t quite capture the experience of reading this — it draws the reader in, allowing us to not just intellectually grasp some new ideas about how the Psalms work, but it invites us into them, and challenges us to inhabit them. We come away with new knowledge, yes, but also with a glad joy of having been with these amazing texts, almost shuddering as if on holy ground, in ways that deepen our faith and discipleship. And this is exactly what Wright says the Psalms do to (for?) us. They are, after all (he never fails to remind us) poems and songs, and they were first (and still) recited, chanted, sung. He tells us of how our brain’s right hemisphere works, and the powerful, life-altering capacity of poetry and of singing. Although he is a historian and Biblical scholar, he knows that these texts are not just to be exegeted and properly understood. They form litanies and are to color our imagination (indeed, with shades of James K.A. Smith, they can shape our desires!) My own reading of this book allowed me to experience this very worldview-shaping, imagination-enhancing, faith-deepening, almost tactile encounter with the texts; they made me long for things, fresh and good things for me and my family, my community and God’s aching world. This is Biblical study, par excellance. It is Rev. 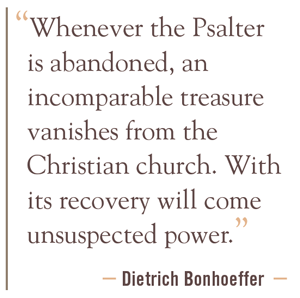 Wright’s worry that many Christians (especially evangelical Protestants and those whose churches are most growing) don’t read the Psalms much, let alone use the Psalter in worship and prayer, either in liturgical, corporate worship or in private devotions. As a cradle Anglican, it has been his practice to uses the Psalms in Morning and Evening Prayer and in weekly corporate worship. Further, he has been drawn to chanting and song (he is a musician himself after all — did you know he majored in trombone in college, and met his lovely wife in a singing group?) So this comes up from time to time, not as scolding, but as a bit of sage advice. We would do well, in our personal lives and in our congregations, to avail ourselves of these means of grace that come at us in poem, image, dramatic lines, and songs. 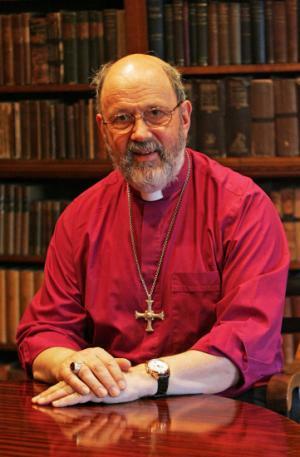 By the way, I wrote a very long BookNotes piece last spring explaining why we so appreciate Tom Wright and highlighting most of his books (and some others, too.) You can see that here. The only other person who I have found to be so compelling in extolling the value of the Psalms for shaping our memory and vision is Calvin Seerveld, who first taught me to love Psalm 19. Oh, and Walter Brueggemann, especially in a set of three talks he gave on Psalms and the City at Pine Street Presbyterian in Harrisburg, tapes of which I nearly wore out. The enormously popular “worship songs,” some of which use phrases from the Psalms here and there but most of which do not, have largely displaced, for thousands of regular and enthusiastic worshipers, the steady rhythm and deep soul-searching of the Psalms themselves. This, I believe, is a great impoverishment. By all means, write new songs. Each generation must do that. But to neglect the church’s original hymnbook is, to put it bluntly, crazy. There are many ways of singing and praying the Psalms; there are styles to suit all tastes. That, indeed, is part of their enduring charm. I hope that one of the effects of this little book will be to stimulate and encourage those who lead worship in many different settings to think and pray about how to reintegrate the church’s ancient prayer book into the regular and ordinary life of their fellowships. As with all thoughtful Christian worship, there is a humility about this approach. Good liturgy, whether formal or informal, ought never be simply a corporate emoting session, however “Christian,” but a fresh and awed attempt to inhabit the great unceasing liturgy that is going on all the time in the heavenly realms. (That’s what those great chapters, Revelation 4 and 5 are about.) The Psalms offer us a way of joining in a chorus of praise and prayer that has been going on for millennia and across all cultures. The introduction to The Case for the Psalms says all this, and it assured me that this was to be a very good book, stimulating, learned, and yet focused on arousing and shaping one’s faith-life. It starts saying it is “a personal plea” but also gets right down to business, explaining some cool scholarly details. 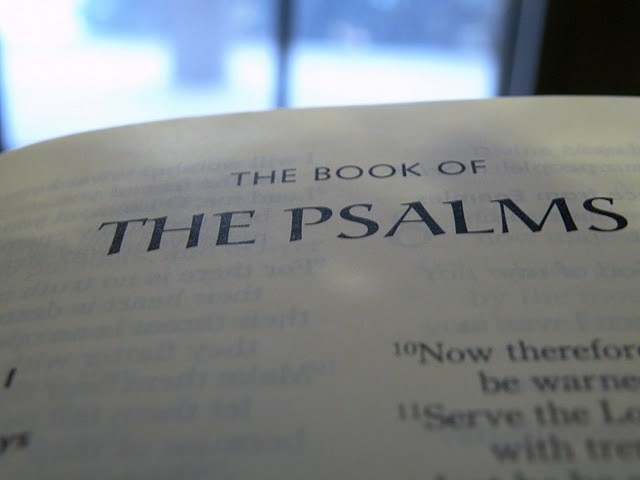 (Did you know that the Psalms are among the oldest poems in the world? Did you know that for a while, during the second Temple, the Levites were paid to do the singing? Did you know that Roman Catholic Bibles which draw on the Vulgate, have a slightly different numbering system for the Psalms, because they combine a few Psalms, and separate others, so the beloved shepherd Psalm is not the 23rd?) The lovely introduction struck a great balance of personal rumination and solid teaching, devotional tenderness and serious challenge, making for a very admirable start. The second big chapter — “Pray and Live” — serves, in some ways, as an overview of the whole book, and points us towards what is to come. That chapter alone is well worth the price of the book. Besides noting Bruce Cockburn (and Schubert) in passing, he explains how important the Psalms are in the New Testament, not least (as he says) in the life of Jesus. Wright’s moving us beyond a rather simple proof-texting of Christological connections towards a broader, deeper way in which the Psalms are Christ-centered is, again, well worth the admission price. This is very important hermeneutical concern, and found it extremely instructive. The Psalms are enormously important in the New Testament, as a glance at any list of biblical quotations and allusion in the New Testament will reveal. Jesus himself quoted and referred to the Psalms in the manner of someone who had been accustomed to praying and pondering them from his earliest days. Paul referred to several psalms and wove them in quite a sophisticated way into his remarkable theology. But behind those explicit references there stands, I believe, an entire world in which Jewish people were singing and praying the Psalms day by day and month by month, allowing them to mold their character, to shape their worldviews, to frame their reading of the rest of scripture, (not least) to fuel and resource the active lives there were leading and the burning hopes that kept them trusting their God, the world’s creator, even when everything seemed bleak and barren. For which whichever bit of the Old Testament we take, in fact, it is always worth asking, “How would devout Jews in the late first century BC have heard, read, sung, and prayed this?” This is particularly true of the Psalms. We cannot be sure which Jews studied which scriptures in what way, but we are on safe ground in saying that they used the Psalms as their basic prayer book. That was the world in which Jesus grew up. As in all of Wright’s books, he is good at summarizing a complex and important thesis: that Jesus, as a first century Jew, understood his own Kingdom mission in light of the covenantal promises of Yahweh given to the Jewish people. There were succinct paragraphs I want to underline, post-it notes stuck here and there. Wright makes it abundantly clear that Jesus’ own identity and mission were shaped, then, by the Psalms, and if we are Christ’s followers, and hope to embody any sort of faithful Kingdom lifestyle in the Way of Jesus, we should allow ourselves and our communities to also be shaped by the intentional reading and praying of these same Hebrew poems. They will — as Eugene Peterson so helpfully put it (by quoting Nietzsche) in his fabulous book on the Psalms of Ascent — forge us towards “a long obedience in the same direction” and help us with our “discipleship in an instant society.” Peterson, who has been an advocate for ritual use of the Psalms for a long, long time, would surely appreciate Wright’s emphasis here on the formational influence of these texts. The next three chapters are the heart of the book, and they are amazingly astute, drawing specifically on all kinds of Psalms, on various texts, and explaining for us how to best understand them. But this is not an orderly march through them, one by one. No, Wright suggests and has on offer three major themes, themes that will give us broader and more robust faith, shaping us, again, at the deepest levels of our imaginations and worldviews. By that, he means that we learn to inhabit time — thinking of our past and certainly our future — as God’s time, in His hands. This requires Biblically-shaped memory and Biblically-shaped imagination. This book helps you think about that, and it is enriching, good, more important than you may realize. What time is it, after all? Similarly, we embrace space in new ways when we realize who God is and how God is reigning over all creation. There are complicated matters here — about Temple and bodies, about Zion and ideology, about prayer and politics, and land and justice, about God’s claims and history’s wreckage of those who abused these claims. It can get sticky, and this explanation if as helpful as any I read. The way the geography and the city is seen in the Psalms, and especially how there is a trajectory from Zion onward, is vital to appropriate in clear-headed, Christ-like ways, and Wright’s insight here is, again, partially intellectual, but more than that. It is an invitation to live into this space of holy concern. Wow. And, lastly, the Psalms effect even our understanding of matter. There are so many beautiful nature Psalms, as they say — we should not say nature, but “creation,” I believe, as it connotes its lively relationship with the Creator. And what a lively relationship it is! So, as with time and space, we are invited to stand at the intersection of the original created matter and the matter of new creation, the original matter that reveals God’s power and glory and the new creation that will be flooded, saturated, with God’s presence and glory. And we do not stand there as mere observers. We, being ourselves part of that extraordinary picture, fine our own stories within the larger narrative of creation — our own small but significant stories of wine and bread, of work and rest, of death and new life, and through it all, of praise. Matter matters; it matters so much that God becomes human and in the resurrection launches that transformed matter, that immortal physicality, to which (I have been suggesting) the Psalms already point forward. There is much celebration in this part of the book, and much to get excited about. For instance, few authors help us appreciate the goodness of judgement — where God vindicates the poor and his trampled creation (think of Romans 8) giving us much to hope for. There are emotions in the Psalms and this is an emotional books. There is the goodness of God, yet, the fear of the Lord; there is the wonder of a complex creation, and the cries of lament; and there is the happy gladness that is ours when we are trained in seeing God’s faithful promises as good gift, hinted at in the very orderly structure of the creation itself, but there is death and decay and weirdness. My, my, this is rich, good, relevant stuff. 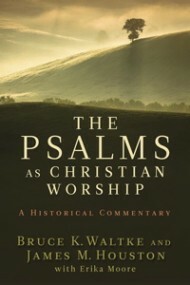 The final two shorter chapters are “At Home in the Psalms” (which offers some guidance and encouragement to start the discipline of using the Psalter in its entirety) and autobiographical, “My Life With the Psalms.” Both pick up, quite directly, this theme that the daily use of the Psalms is a rich and helpful spiritual practice. In the final afterward he merely narrates his own journey through his favorite Psalms, how he has used some, how he has prayed others, how he has found others to be pointers to God’s will in his own life. His story about his own father’s death just a few years ago — something we talked a little bit about when he visited with us here at the shop last year — brought tears to my eyes, and I finally just let is wash, as I cried tears of joy for a scholar/pastor/brother of this sort. There are few heady scholars in the academy who would be so vulnerable and simple as to share these nearly common-place insights. This lovely and tender closing offered a very nice and instructive ending to a life-changing, great book. Thanks be to God. 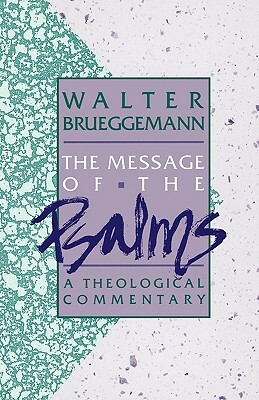 T he Message of the Psalms: A Theological Commentary Walter Brueggemann (Augsburg) $18.00 A modern class where the passionate, dense scholar explains the Psalms as those of orientation, disorientation and re-orientation. Remarkable. T he Psalms as Christian Worship: A Historical Commentary Bruce Waltke and James Houston (Eerdmans) $28.00 A magisterial volume (almost 650 pages) blends a verse-by-verse exposition of select psalms with a history of their interpretation in the church from the time of the apostles to the present. Learned, thoughtful, mature by two esteemed evangelical scholars. 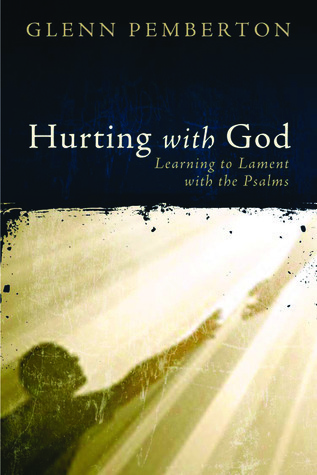 H urting with God: Learning to Lament with the Psalms Glenn Pemberton (ACU Press) $19.99 When this book (which Brueggemann calls “a masterful study of the Lament Psalms”) came out we named it one of the books of the year! It offers solid Biblical and historical scholarship, passionate pastoral concerns, and honest, raw, insight. 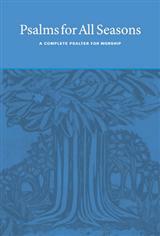 Also includes some concrete proposals on how to use these psalms in the church’s worship. 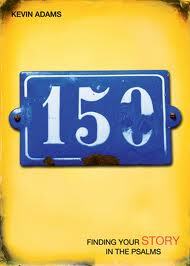 1 50: Finding Your Story in the Psalms Kevin Adams (Square Inch / Faith Alive) $14.99 There are many lovely devotionals based on the Psalms and this is a wonderful, provocative, moving, work. Lavish blurbs on the back from Haddon Robinson, James K.A. Smith, and Cornelius Plantinga, which speaks to the books elegant and insightful vision. Remarkable. P salms for All Seasons: A Complete Psalter for Worship Martin Tel, Joyce Borger, John D. Witvliet (Calvin Institute of Christian Worship / Brazos) $30.00 There are other hymnal-like hardback song books that put the entire Psalter to common tunes, and this is doubtlessly the best. This is an amazing, comprehensive resource, offering an stunning array of indexes so they are easily used in planning worship. It includes musical settings useful for morning or evening devotions as well as responsorial settings for all the psalms in the Revised Common Lectionary and other good features. This is a true treasure trove, a must-have resource, which we are proud to promote.